I remember when I was 10 years old my 5thgrade English teacher was afraid of Halloween. She described it as the worst day of the year. I can vividly remember her saying that after school was over she’d rush home, hang up sheets over her windows and turn out all the lights so that no one would be able to tell that she was there. She said she hated Halloween and that it scared her. 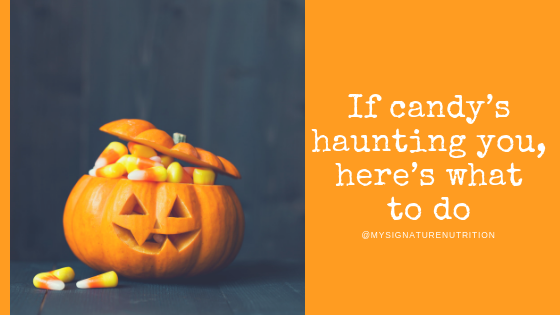 She never exactly said why…I mention this because I often see this level of fear and anxiety related to Halloween but for my clients it’s around the food- particularly candy. When you struggle with your eating, Halloween (and thus candy) is something to be feared. Instead of feeling excited about Halloween you end up feeling panic and dread. When you have peace with food, candy is one of the joys of Halloween! After all, what other day of the year can you run around (in a costume none the less) knocking on strangers doors asking for candy- and they give it to you!? My kids love it. They’ve been practicing trick or treating since the month began. They pretend with toys, paper, and whatever else they can find. They’re so excited! What happened to make you go from this level of excitement (you were that excited once too) to one of anxiety and fear? What’s changed? 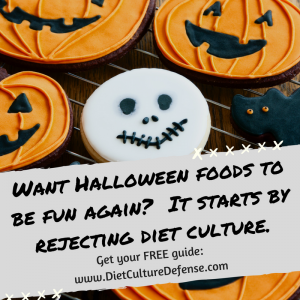 It’s your thoughts and beliefs that have stolen the joy from Halloween and candy. Think about it- The food hasn’t changed. The candy hasn’t changed, Your body haschanged. (That’s appropriate- it shouldn’t be the same size you were when you were 10.) You might be saying yes, but my body’s changed too much. The truth is, regardless of how much your body has changed, it’s not about your body. It’s about your relationship with food- your thoughts and beliefs about food. 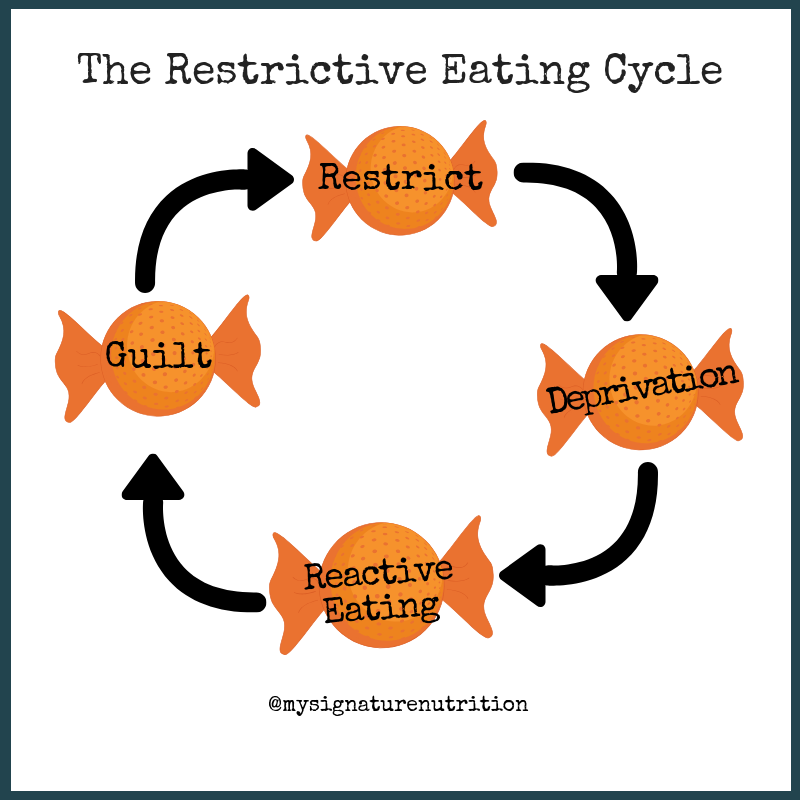 Restriction –>deprivation–>reactive eating –>guilt. When you’re weight focused, weight can be a part of that cycle too. 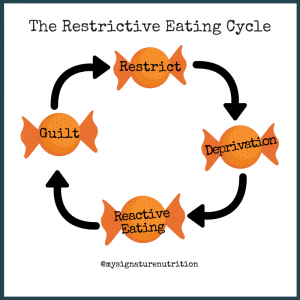 Desire to lose weight –>deprivation –>reactive eating–>guilt–>increased weight focus. 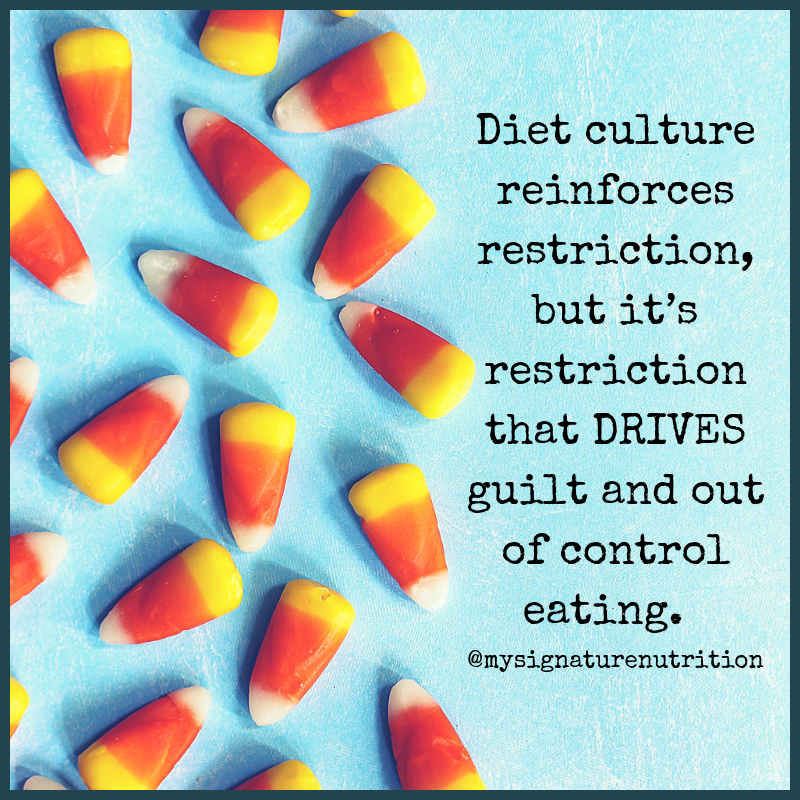 Diet culture reinforcesrestriction, but it’s restriction that DRIVES guilt and out of control eating. In diet culture, the solution to fear or anxiety around food is to restrict. To take 30 whole days where you don’t eat certain foods, to cleanse yourself, to forbid yourself food. But this solution just perpetuates the problem, blames you, and reinforces fear around food. The irony is, when you were a child you ate the candy you wanted and were done(assuming neutral circumstances around food). It wasn’t until you started questioning your food choices that you relationship with food got worse. When you have permission to eat what you want, you end up eating less. 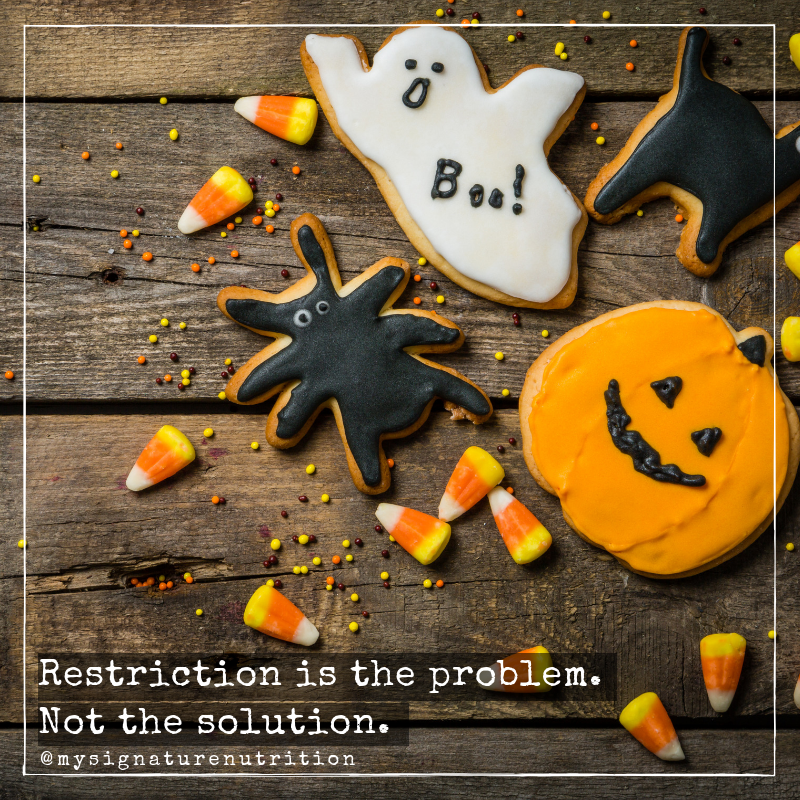 It’s the food rules and restriction that drives greater food interest, cravings, and anxiety around food. Because restriction is the problem- it cannot be the solution. If you feel out of control with candy or anxious about having it around, then the solution is to work on permission. Yes, permission to eat candy. Permission is so much greater than self control and will-power. 1. Be curious. Examine your thoughts and beliefs about food, examine your food rules, examine where your food rules came from. 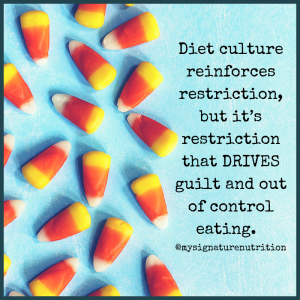 Diet culture messages can be hard to discern but if it’s fear based, causes restriction and makes you feel worse it’s not going to work long term. This small shift in thinking from judging to curiosity can start the pathway to healing your relationship with food. 2. Eat Enough. Candy will always sound good if you’re not eating enough food. A hungry body is NOT a body that wants carrots or salad, it’s a body that wants glucose (aka sugar). A hungry body will always crave apple pie over apples or carrot cake over carrots. Your brain needs energy and it prefers glucose. That’s normal and natural. If you’re not eating enough food, candy will always be more appealing. Therefore, if you want to be less tempted by candy, make sure you’re eating enough and responding to your body. 3. Eat Candy. Give yourself permission to enjoy candy! If you’re feeling really anxious and out of control with candy, start with just one kind or even flavor of candy. Eat the candy, notice how it tastes, the texture, notice your thoughts and beliefs about the candy, recall the memories associated with that candy, and notice your anxiety before and after eating. If you’re feeling overwhelmed use coping skills to help reduce anxiety. Then repeat the candy again! (next meal, next snack, next day, etc). If you feel unsafe with an entire package, buy a single serving pack. As you eat remind yourself that you can have more. Repeat this process again and again until the candy is neutral; then move to another candy. If you feel comfortable you can certainly do more than one kind of candy at a time. If you’re fearful or struggling, then doing all candy at once can make the process harder. If this sounds overwhelming to you, I recommend checking out the books Intuitive Eating: A Revolutionary Program that Works or Body Kindness: Transform Your Health from the Inside Out–and Never Say Diet Again (affiliate links). I also encourage you to reach out for support from a trained weight neutral or non-diet dietitian. As a gentle reminder, healing your relationship with candy, isn’t just about you- it’s about you and your children and even your children’s children. Healing your relationship with food has an intergenerational impact that will significantly benefit your family.